Don’t pay a dentist hundreds of dollars to do something you can do yourself! Taking your own dental impression is easy. Follow our simple tutorial to take your teeth impression for your custom night guard (mouth guard for teeth grinding), athletic mouth guard, or custom teeth whitening trays. We mail out a dental impression kit to you (putty & trays). Following the easy instructions, you take your own dental impression. Using the prepaid envelope, mail the impression back to us. Upon receipt of your impression we will fabricate your new mouth guard within (7-14) business days. Custom-fit night guards & whitening trays within (8-12) days. That’s it! Warranty Information: 100% satisfaction or 90 day money back guarantee. If you’re not happy with your new night guard for any reason, Sentinel will either offer a full refund (provided you contact us within 90 days of receiving your night guard) or we will work with you until we get it right. PLEASE NOTE* Your full refund will be issued for the amount you paid for the product. We offer all inclusive free US shipping. Our $75 all inclusive expedited service (all inclusive priority shipping + 2 business day turnaround time) is non refundable. Not a problem! If you change your mind please contact us as soon as possible to receive an immediate refund. If impression kit was already mailed to you, please return unused kit within (30) days of purchase to receive full refund. Defects and wear policy: If your custom night guard becomes defective and/or wears down before stated time frame (see below) we will replace at no additional cost to you (upon receipt of defective/worn night guard and original invoice). The word is finally getting out about over priced dental offices. There are many expenses you simply cannot get around at the dental office. Fortunately, you CAN get around paying hundreds of dollars for a true custom fit nightguard. How so? As with many medical expenses, the truth is, a night guard really doesn’t cost that much to make. What you’re really paying for is the tailored fit and the comfort that comes from having the device made specifically for you. 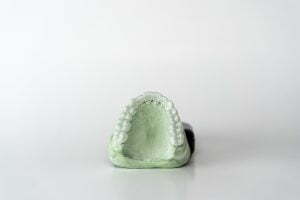 By taking your own dental impression (we supply everything including the prepaid mailer), you can get that very costly night guard for way less. Why should I get a custom made night guard instead of the cheaper stock one at the store? What’s the difference? 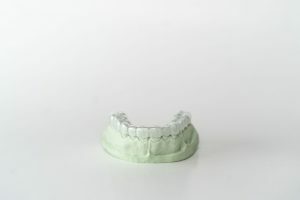 A custom night guard made from a dental impression of your teeth will fit every contour of your unique dental anatomy. It will not fall out and you will be able to sleep soundly with your custom dental appliance. The stock types are standard one size fits all that are mass produced in a factory somewhere and lack the ability to conform to your teeth. The boil & bite or heat moldable mouthguard is a step up from the stock ones because you are able to boil the plastic in water & somewhat conform it to your teeth. Please understand the fit will be subpar to that of a true custom guard. There is a good chance your boil & bite sleep guard will slide around during the course of the night. This presents a number of problems. First, recent studies have indicated that if a plastic appliance is not snapped in & truly fitted to your teeth, you may have the desire to chew on the plastic while you sleep. This can cause your Bruxism to worsen! 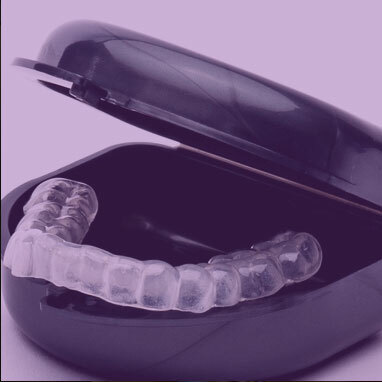 It is absolutely imperative that you have a properly fitted sleep guard that hugs your teeth. Another problem is comfort. Often people that have tried the boil & bite night guards complain that they cannot sleep comfortably at night because they are still “bulky” and “uncomfortable”. Lastly, the quality of the material in both the stock & boil & bite guard is well..cheap. If you put much force on this cheap plastic, you’re going to grind through it pretty quickly. The price of these boil & bite guards ranges from about $20-$30. For less than $100 you can get a professional custom fit soft clear night time guard from us and the material we use is FDA approved, top of the line, dentist grade dental material. Basically, it’s the difference between getting a pair of nice pants custom tailored for you and throwing them in the dryer in hopes that they will shrink a little. When it comes to your sleep, don’t sacrifice quality. You will regret it in the morning. What is the difference between the custom night guard my dentist wants to make for me and the ones through the online dental lab? Please note: There are certain night guard devices that require more involvement in construction than the traditional custom night guards used to treat bruxism (teeth grinding, jaw clenching). These more complicated types used for jaw realignment or severe TMJ may involve metal clasps and/or ramps and must be made through a dental office. We do not make this type of appliance. According to the American Dental Association, experts are still not sure what exactly causes teeth/occlusal grinding but they do have some leading suspects. At the top of the list-stress. There are several things you can do to reduce your everyday stress thereby hopefully reducing the intensity of your teeth grinding or clenching habits. Read our blog about ways to reduce stress at Quora.com! An abnormal bite can cause teeth grinding as well. You should talk to your dentist about what you can do to remedy an abnormal bite. Missing or crooked teeth can also be the culprit that entices teeth grinding or jaw clenching. Researchers have discovered that persons prone to sleep disorders tend to be higher risk for teeth grinding and or clenching. What happens if I don’t get a night guard and continue to grind my teeth? What’s the worst that can happen? Over time the constant grinding and/or clenching can wear down the enamel. As seen in this picture to the left, the person has suffered from Bruxism to the point where his softer dentin is now exposed. This can cause rapid tooth decay. Replacing these 4 front teeth will cost roughly between $3500-$7000. Other common effects of teeth grinding include loosened teeth, breaking existing dental work (bridges, crowns, partials, etc. ), extreme tooth sensitivity, worn out & or flattened chewing surfaces (including cusps and the natural contours and grooves of your dental anatomy -making chewing food difficult). If left untreated, many people will wear their teeth down to the point that they are in dire need of very expensive teeth restoration procedures. Long term teeth grinding can also cause changes in ones appearance. Jaw pain, occasional swelling of salivary glands, earaches, neck aches, hearing loss, and the notorious headaches are all familiar short & long term results of Bruxism. Is there anything I can do to lessen the severity/intensity of my teeth grinding? Or maybe stop it all together? Yes! There are steps you can take to try to minimize the degree of which you grind or clench. You should know that these are not guaranteed remedies but rather some things you can incorporate into your daily routine that will hopefully help. In some cases, people have been able to train themselves to stop altogether. Start by training yourself during the day. If you find that you clench your teeth together or grind during the day, put your tongue in between your teeth. Try to be aware of the habit and relax your jaw. Avoid caffeine, lots of sugar, smoking, and alcohol. It has recently been reported by researchers that taking Magnesium once a day can combat against Bruxism. Of course stress has been linked to teeth grinding time and time again. Learn to manage your stress. Take control. Find out what is causing the source of your stress/anxiety and take positive action to resolve it. In the meantime, wear your custom fit night guard to prevent any further damage. A custom fit night guard is far less expensive than the teeth restorations you will most likely need in the future. You have several night guards to choose from. How do I know which one to choose? And should I choose an upper or lower guard? We currently offer three types-a hard acrylic night guard, a dual laminated (two layers-soft inside/hard outside) style, and a soft pliable style. Each of these guards are made from top grade materials, FDA approved, & BPA free. They all will fit snug (but not tight) against your teeth but each has a different feel to it. When choosing which sleep guard is right for you, you must determine how severe your grinding habits are and what particular concerns you have. All of these guards will combat against headaches, jaw/facial pain, & protect against occlusal damage. But you may be worried (for instance) about your teeth shifting, or alignment issues. The hard acrylic guard is great for keeping your teeth in place. It is also very thin but tough to grind through. The dual laminated guard is a bit thicker than the hard acrylic (by 1 mm) though it is still thin by industry standards and offers a soft gel like interior with a hard outer shell. Between these two (the hard acrylic and dual laminated) it really just comes down to preference. Some love the thin hard acrylic types and others prefer to have their teeth encased in the soft inside of the dual laminated guard. Customers love the .120 soft night guard for it’s comfort. Very recently, there has been a shift in the way dentists and researchers are viewing the soft night guard. This soft type has generally been the most common style of night guard produced in dental offices but recent research has indicated that the soft material may actually encourage grinding by up to 50%. The cases that have been reported/studied show that this relatively new revelation is seen more typically with the thicker, bulkier soft plastic guards (such as when a person buys an over the counter mouthguard and tries to conform it to their teeth). Nevertheless, you should be aware of that risk when choosing your custom night guard. When deciding on an upper or lower custom night guard, there may be some obvious factors that will dictate your decision. For instance, if you’re missing teeth on either the upper or lower set, you will want to choose the set that has more. Or if you know you’re grinding your teeth, and you need to get a night guard quickly but you have some upcoming dental work on your upper teeth (or vice versa) that may change your dental anatomy, you will want to go with the lower teeth (or vice versa). Same thing with loose teeth, or loose crowns/bridge work, etc- You’ll want to choose an opposing guard and avoid the potential to loosen that dental work with the continuous use of a tight fitting night guard. Now, if you have all of your nice solid teeth on both the upper and lower and no plans for upcoming dental work, it really just comes down to preference . History tells us that the upper guard has been the “go to” choice but if you think a lower guard would feel more comfortable then go for it. We’ve had an overwhelming amount of customers say that they prefer the lower guard over the upper as it tends to be smaller and less obtrusive.